Wondering where to stay in Pittsburgh, Pennsylvania? 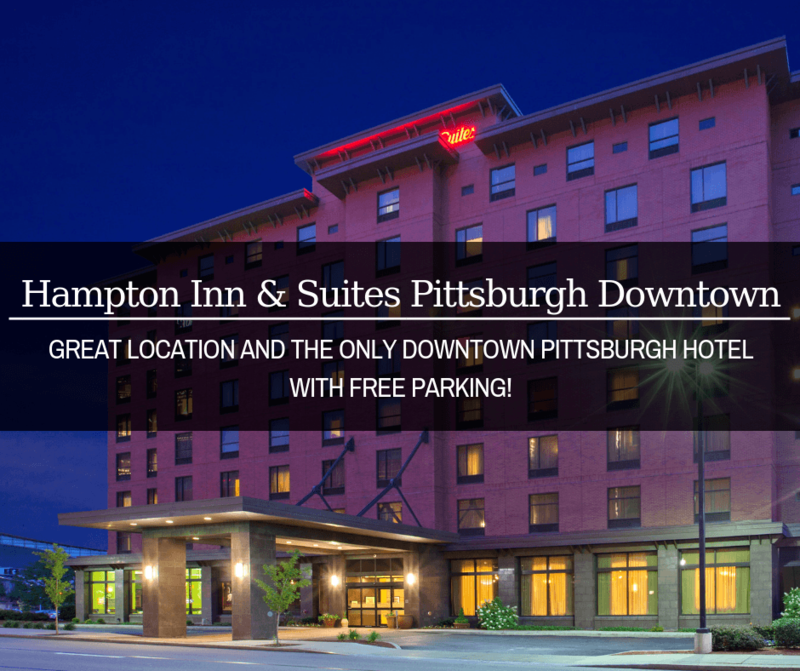 We recommend the Hampton Inn Pittsburgh Downtown. It’s in a great location and it’s the only downtown Pittsburgh hotel with free parking! Pittsburgh is a large city. While you’re visiting, you want to be close to the attractions that you plan on going to. We recommend being close to downtown, but not necessarily right in downtown. That’s why we think one of the best places to stay in Pittsburgh is the Hampton Inn & Suites Pittsburgh Downtown. The Hampton Inn Pittsburgh Downtown is in a great location. It’s in between downtown and Pittsburgh’s historic Strip District and it is literally across the street from the Senator John Heinz History Center. It’s also less than a mile away from many other Pittsburgh museums you’re most likely planning on visiting. Besides the location, we also really liked the hotel itself. Our suite was huge! As soon as we walked in we saw a wet bar that had a microwave and small refrigerator. And then when we walked around the corner and saw the rest of our room. Holy moly! There was a sitting area, desk, TV, and a huge king size bed. We always love staying in Hilton properties because of their beds. They’re always so comfortable! And besides the bed, our second favorite part about our suite was the incredible sunset we got to watch right from our window. Isn’t it gorgeous?? Who doesn’t love a free hot breakfast? We were up early to explore Pittsburgh, but we made sure to start our day off right. The hotel had a really nice breakfast area with a large variety of things to eat, including make-your-own waffles! There was also plenty of seating available. The Hampton Inn Pittsburgh Downtown also has a lot of great amenities. If you’re looking for where to stay in Pittsburgh that has free parking, guess what? This is the ONLY hotel in downtown Pittsburgh with free parking. The hotel also has free WiFi, an indoor heated swimming pool, a fitness center, a 24-hour business center, and an on-site guest laundry facility. We’ve mentioned the great location already, but felt we needed to discuss it some more because of just how great it is. We loved the fact that we could walk to a few different places from the hotel, including Heinz Field and PNC Park if you’re wanting to catch a football or baseball game. If you’re on a business trip to Pittsburgh, you’ll be happy to know that the David L. Lawrence Convention Center is only a block away and the Medical District is nearby as well. Additionally, the University of Pittsburgh is only three miles away. We really enjoyed our stay at the Hampton Inn Pittsburgh Downtown. It was spacious, clean, and everyone was really nice. In fact, the night that we checked in there was a movie coming out that we really wanted to see. The woman at the front desk was able to recommend a great movie theater and a few places to get dinner. I love Hampton Inns, they are comfortable, large rooms and the breakfast service is perfect. I’ve stayed in a few of them and they are just what I look for every time. The suite looks so spacious. I like those extra touches of having a decent fridge and microwave in the room. Perfect for a longer stay or business travel. Sweet digs. Plus that free parking deal is good money. Anytime you find that in a city you better take advantage of it. Hampton Inns are great; I love staying there. I grew up in Pittsburgh and would love to visit again. Hampton Inn in Pittsburgh Downtown looks like a pretty decent accommodation option. The suites look comfortable and spacious too. Pittsburgh is a great city. I love being in the downtown of a big city but still be able to walk around to see the major sights. Being within walking distance of PNC Park and Heinz Field makes for a great trip! Good to know about the free parking, that can be a hassle especially downtown in big cities. What a huge hotel room! And there are DIY waffle makers for breakfast? What more could you want! Thanks for sharing. Wonderful properties. I’ve heard great things about Pittsburgh. I like how spacious and relaxed all these hotels look. Sometimes you don’t get that luxury in larger and crowded cities. I grew up in Erie, less than 2 hours away from Pittsburgh. I recently visited Pittsburgh again after many, many years and it’s such a cool city now. Trust me – it wasn’t in the ’80s when I was growing up. I agree that you want to be downtown. If you’re sticking in the city, you actually don’t need a car at all and the public transportation is pretty good. Hampton Inn looks like a good choice and the free parking alone is an amenity that makes it worth booking. This certainly looks like a fab hotel, seems they have thought of everything and that sunset view is spectacular. Plus I love the make your own waffles touch, never seen that anywhere before. Whenever I search for a hotel to stay in, the two most important things for me are the location and the breakfast and it seems Pittsburg Hampton Inn fares well on both aspects! The fact that it is between downtown and historical district is a clear advantage and the free hot breakfast sounds amazing too! Hampton Inn seems to be a perfect place to settle in and explore the wonders of Pittsburgh. I like the fact that it is strategically located and the museums are within easy distance. The suite looks really massive and I love the sober tones in which the rooms have been done up. Looks so elegant and classy. And of course, nothing cheers more than a hearty breakfast to start of the day, especially when you are travelling.